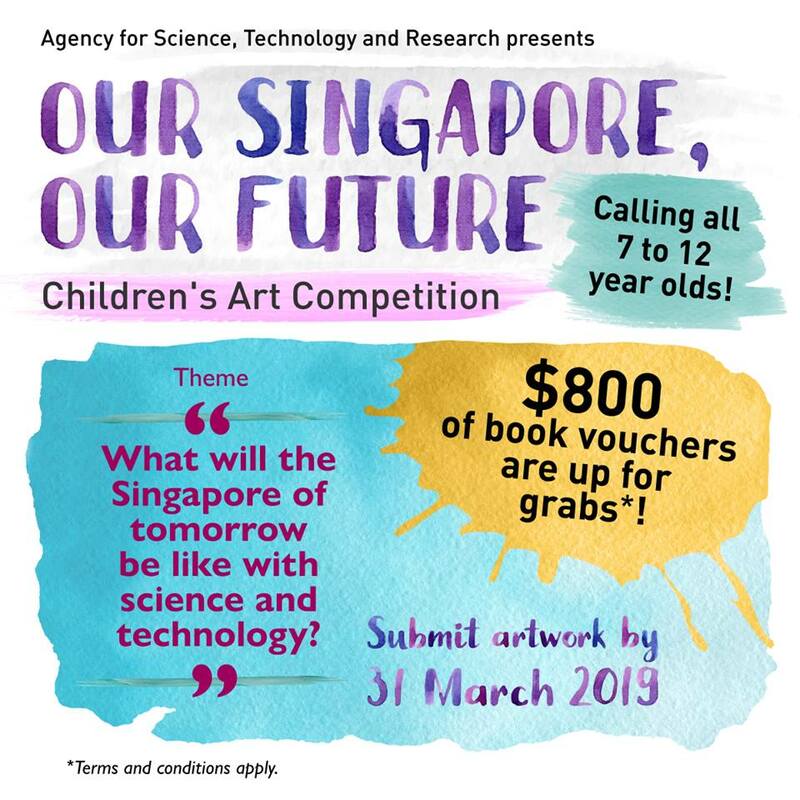 The Agency for Science, Technology and Research (A*STAR) is organising “Our Singapore, Our Future”, a Children’s Art Competition that aims to engage the artistic creativity of children between 7 to 12 years old. Participants have to submit an artwork depicting what the Singapore of tomorrow will be like with science and technology. Winning artwork will also be adapted creatively into A*STAR’s corporate gifts. First prize winner gets a $300 bookstore voucher! Winning artwork will be adapted creatively into A*STAR’s corporate gifts. Submit your artwork at http://bit.ly/astar_artcomp by 31 March 2019. Results will be announced in April 2019. More information on the Facebook page! We are very proud to announce we have completed another fantastic run as the Children’s Art Gallery and Art Studio Partner at The Affordable Art Fair, Singapore! It was held in the F1 Pit Building with great views of downtown to lift Contemporary Art to even higher climes! We exhibited over those four days 148 works of VIRTUOSO young, emerging artists on our ‘Children’s Art Gallery’ Walls. For many this was their first foray into the professional arts scene and the response from the public was outstanding! The addition of a framed series of surrounding walls where students could execute spectacular live Doodles was particularly enthusiastic! Engaging audiences of children ages 4yrs-17yrs with a look at the many worlds within our dreams, Little Artists Art Studio students delved into the powerful pizzazz and haunting emotions within the dreamscape. Then onsite Little Artists Team combined hands-on Fine Arts workshops in rich charcoals, lush pastels, and vibrant watercolors with our highly popular Children’s Art Tour. Whether we were learning about Hyper-Realism or the value of 100 Limited Edition prints, it was a playful yet eye opening behind-the-scenes look at international Contemporary Art and Collecting and Artists. Children on our tours were introduced to major Contemporary Artists from Holland, Thailand, China, Indonesia, Singapore, and many more countries—they had photos and videos and signed cards. Creating a seamless link from the thoughtful Adult experience into one of youthful inspiration and engagement, the aim at Little Artists Art Studio is always to make High Art accessible to young minds brimming with unspent creativity. VIRTUOSO Exhibition Series 2016: Little Artists cherishes their students and celebrates their talents far and wide. Our previous SAVANTS Exhibition series 2015 was viewed by nearly 35,000 art lovers across Singapore from the F1 Pit Building to The Arts House to Suntec to NLB Marine Parade Library. Little Artists students were the promising, young emerging artists in Singapore in 2015! Launching a new chapter in fine arts, Little Artists students, aged 3yrs-17yrs, will be displaying even more originality in the VIRTUOSO Series! Works displayed will be original in concept. The first show drew inspiration on dreams. Our aim is to highlight these highly diverse artists within both traditional and untraditional platforms where more people can celebrate their talent face-to-face. Kid’s Art Studio & Kid’s Art Tours Manager – Singapore Contemporary & Little Artists Art Studio Unite! We are thrilled to announce that Little Artists Art Studio has been chosen by the Singapore Contemporary as the Macey and Sons Kids Art Studio & Macey and Sons Kids Art Tours Manager. Launching their inaugural show at Suntec from 21st-24th January, 2016, Singapore Contemporary is bringing with them the theme of ‘A world of art’! Browse and buy from a unique selection of original paintings, limited editions, sculpture and photography from Asia, Australia, Europe, and North and South America. From the 21st-24th January, 2016 delight in some of the world’s most famous and innovative artists (Kusama, Warhol, Britto, and more!) Little Artists Art Studio teachers will be guiding both on-site art classes across various mediums and conducting stellar art tours around the fair for the under 12s. We are very proud to announce we have been selected as the Children’s Art Studio Partner at The Affordable Art Fair, Singapore for the grand November 12-15th show at the F1 Pit Building! Even better than that we will be exhibiting over those four days 125 works of young, emerging artists on our ‘Youth Art Gallery Wall’. Rather than a white wall with standard branding we thought let the artistic voices of young Contemporary Artists say what we can do together! Please come and support these budding artists as they make their first foray into the professional arts scene! Winding through voluminous vistas, poignant portraits and Pop Art pizzazz, the Children’s Art Studio will create a transformative gallery showcasing astounding and playful works by Little Artists Studio students as well as works created by children who join us onsite. An Exploratory Art Adventure theme will combine hands-on fine arts workshops for children of varying ages, in varying mediums and styles, together with riveting youth tours around the fair. Creating a seamless link from the thoughtful adult experience to one of youthful inspiration and engagement, the aim is to make high art accessible to young minds brimming with unspent creativity. As part of the activities, complimentary activity packs will be crammed with a range of arty fun to help children discover their creative talents in new ways! (limited quantities available). UBS invited Little Artists Art Studio to enliven the annual Family Day, by creating a three-hour program where children aged 4-12 and their parents could experience the UBS fine art collection with various styles of art applications. We painted unique tote bags, using Irish painter Michael Craig-Martin as our inspiration, mixing letter printing with images of every day items such as headphones, watches, and milk cartons. We made sand art in the style of American abstract painter and cartoonist, Roy Lichtenstein, funking up his original piece ‘The Melody Haunts My Reverie’ piece, by changing the color compositions and allowing the children to have total artistic creativity. We did pour painting (also known as drip painting) in the style of performance artist John Armleder, showing children how to create different colors and patterns with the aid of gravity and squirt bottles. Finally, we used two Spin Bikes to recreate the mastery of English painter and installationist, Damien Hirst’s spin art. The colors were shot out of bottles onto a spinning platform, moved by the frantic ridding of the cyclist—a true team art sport! The feedback was as epic as the crowds! Little Artists’ teachers gave a 2-hour class on structured and free-form drawing, bringing captivating landscapes from the natural world to life, injecting fun characters from Despicable Me and Madagascar to add a splash of difference! Helping both novice and experienced artists discover broad techniques of expression through drawing, more than 40 participants aged 7-60 had the opportunity to work with and learn from practicing artists with a passion for teaching uninhibited creativity at every level. It was one of Marine Parade Library’s most successful Sharing Sessions, and Little Artists has been invited to offer other drawing classes throughout the year at various branches. Tyler Tan has been a student at Little Artists Art Studio since he was six years old. He was invited to create and then donate ten paintings to raise funds for therapy for children coming from unstable or broken homes. Last years’ artists raised nearly $40,000, and the OCBC Sponsors are sure this year they will double that amount and help a lot of children get the support they need. Over the course of two month’s Tyler spent nearly every weekday in the Studio crafting owls, dogs, whales, city scenes, ant’s nests, conceptual art pieces and more for the auction, hosted at OCBC Headquarters in Boat Quay. He said he was happy to do it for the children. His teachers at Little Artists worked tirelessly to help him, and the results are fantastic. His little brother and little sister have since joined the Studio and all three are still attending weekly classes. HE was featured in Today Newspaper and News Asia, and we are very proud of his success.